Did You Know? Items not owned by Carter Library are available through Interlibrary Loan? Interlibrary Loan (ILL) is a service that allows patrons to request books, articles and other materials not owned by Carter Library through reciprocal agreements with other state and national libraries. Current Ivy Tech - Southwest students, faculty and staff are eligible to use ILL services. A valid ID card is required to request ILL material. Always check Carter Library resources first before requesting ILL material. Use this form to request journal articles not available in print or full-text in subscription databases at Carter Library. 1. 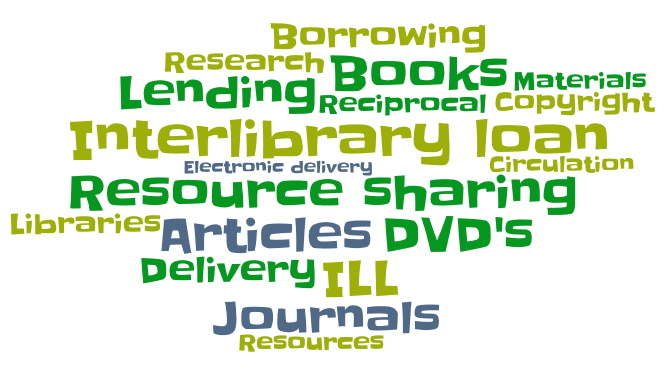 What is interlibrary loan (ILL)? Interlibrary loan (ILL) is a service provided to Ivy Tech students, faculty and staff that provides access to materials not available at Carter Library. Books, journal articles and other desired items from libraries in Indiana and the United States. 2. How do I submit an interlibrary loan Request? Verify that Carter Library does not own the item(s) in IvyCat and that you have no overdue items or fines. Search WorldCat to find the item that you would like to borrow. 3. How long does it take to receive and interlibrary loan request? Generally, physical items take 3-21 days; articles take 3-5 days. Arrival time varies depending on item availability, location, and shipping method. 4. How much do interlibrary loan requests cost? 5. How will I know when my request has arrived? 6. How do I retrieve my articles when they arrive? Articles are delivered electronically via email. Copyright restrictions apply. 7. How long can I keep interlibrary loan requests? Loan periods are generally 2-4 weeks; the loan period is decided by the lending library. Copies are yours to keep. Electronic articles are delivered as PDF's and are available for five viewings or 30 days, whichever comes first. Please print or save your copies. 8. What are the interlibrary loan overdue policies. Overdue interlibrary loan books may block library privileges and/or incur fines. 9. Are Ivy Tech community card holders eligible for interlibrary loan? No, interlibrary loan services are not extended to Ivy Tech community card holders; these patrons should request interlibrary loan services through their local library. Before requesting books, articles, etc. through Interlibrary Loan, verify that Carter Library does not already own the resource. Check in IvyCat for books and other physical (returnable) items. Check here to see if the desired article/journal title is available in full-text in subscription databases. Carter Library owns over 40 print journal and newspaper subscriptions, with back issues available. Check this link to see if the library owns the journal/newspaper issue you need. Under certain conditions specified in the law, libraries and archives are authorized to furnish a photocopy or other reproduction of copyrighted materials. One of these specified conditions is that the photocopy or other reproduction is not to be 'used for any purpose other than private study, scholarship, or research.' If a user makes a request for, or later uses, a photocopy or reproduction for purposes in excess of 'fair use,' that user may be liable for copyright infringement.